The phototube works by having light strike the almost flat transparent end of the tube (the photocathode) (see the tube photo below). Electrons are ejected from the cathode and move through the tube to the anode at the other end. These simple photo sensors have been replaced by solid state devices. The phototube is related to the photomultiplier, however the photomultiplier tube uses the amplification feature of vacuum tubes to take very small IR or visible light signals and magnify them. If it weren’t for the vacuum tube television and video would not have been developed. 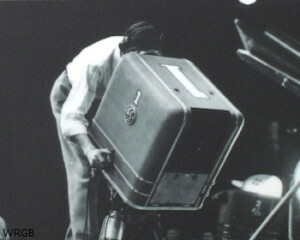 Engineers specially developed the camera video tube to “see”. The long and large vacuum tubes made it so early video cameras had to be large. This is a studio camera at WRGB in Schenectady in the first decade of television. In a camera video tube the cathode end of the tube has electrically charged material as a coating so it can collect photons. A beam will scan the surface and gather variable voltage values helping to tell the device where bright/non-bright areas are. Early tubes used a mica or glass insulator with photosensitive globs/islands of cesiated silver oxide. These would hold energy from the light long enough that the scanning beam could hit them and read the data. Later tubes used a continuous coat of photo-emissive material. More on camera video tubes. 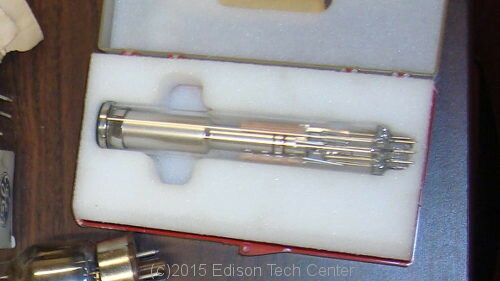 A camera video tube on display at the Edison Tech Center. This particular tube was a replacement tube for studio cameras at WMHT (PBS). Tubes would burn out and had to be replaced. We are still building this page, visit Unit 1 for a complete unit.